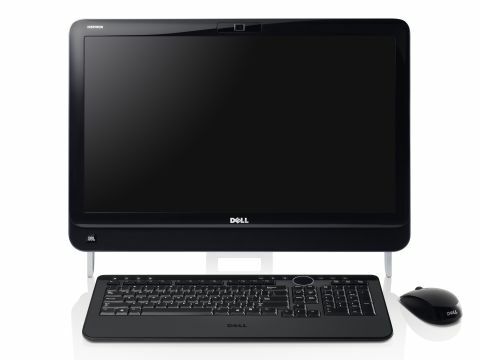 We're certainly warming to all-in-one computers, and if they continue to be as good the Dell Inspiron One 2320 we can happily see them taking over all of our desks. Positioning itself between low-end models such as the bargain Advent Discovery MT1804 or the well-balanced MSI Wind Top AE2210, its pricing comes in under high-end models such as the ultra-expensive Apple iMac 27-inch 2011 and the more wallet-friendly Sony Vaio L Series. The £799 price means a lot, and there's a lower-end Pentium model also available, at an MSI Wind Top AE2210-beating £599. As with the other PC all-in-ones we've mentioned, the main "new" headline feature - despite the option of the Sandy Bridge Core i5 processor - that the marketing boys are dying to tell us about is the touchscreen. Decades of careful mouse-based interface design down the tube, as it's far more fun stabbing your podgy fingers at a desktop screen. But what a lovely screen to stab your fingers at. Again Dell hasn't cut corners, with a Full HD 1920 x 1080p 23-inch display, large enough to be happily used to watch TV or enjoy films. Unlike many other models, the Dell Inspiron One 2320 can even be wall-mounted by removing the feet and rear stand. As a wall-mounted unit the touchscreen would come into its own, as Windows Media Centre is touch-enabled and that in itself takes care of all your media entertainment adeptly enough. For desktop use, a black wireless full keyboard and mouse are supplied. These match the black bevelled styling of the main computer, which uses two minimalistic silver feet to raise up from the desk.